Once you are CLEARED HOT, now what? Known simply as “FlyGirl”, Vernice ignites her audiences with a dynamic spark that can’t be extinguished. Soar through the execution of any plan by harnessing the power of a “Breakthrough Mentality” mindset! From the moment she leaps into the audience, she shows attendees how to go from “Zero to Breakthrough” and create a personal flight plan utilizing her candid strategies to help win on the battlefield of life! 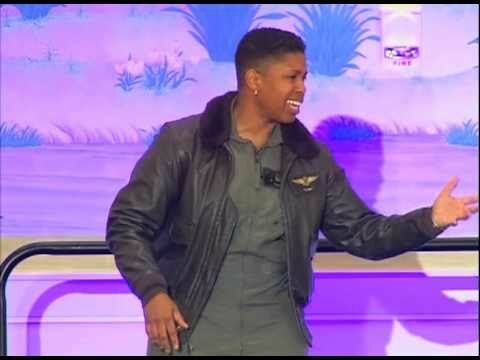 Leveraging her “Breakthrough Mentality” mindset, she propelled herself from beat cop to combat pilot in a record-breaking three years and became the U.S. Marine Corps’ first African American female pilot and, shortly after, was recognized as America’s First African American Female Combat pilot by the Department of Defense. Upon her accomplishments, she published her first book, Zero to Breakthrough™ in 2011. From her experiences, she created a 7-step process called the Zero to Breakthrough™ Success Plan. She now travels extensively sharing this message through her keynotes, coaching and seminars. She is your battle-tested speaker and ignites audiences with a dynamic spark that can’t be extinguished. Lead your team through the execution of any plan by harnessing the power of a “Breakthrough Mentality”! From the moment she leaps into the audience, she shows attendees how to go from “Zero to Breakthrough” and create a personal flight plan utilizing her candid strategies to win on the battlefield of business and life! Upon completion of two tours in Iraq and leaving the military, Vernice leveraged her “Breakthrough Mentality” mindset and launched VAI Consulting and Training, LLC. By applying the Zero to Breakthrough™ Success Plan to her own company, Vernice produced over six-figures in revenue within the first 12 months! Her passion is helping organizations and individuals create similar results. An honorary Doctorate of Laws was conferred on Vernice from Chancellor University in 2010. She has also received awards as a pioneering pilot, to include her commanding role in Science, Technology, Engineering and Mathematics (STEM). She was the Marine Corps’ first African American Female pilot, first African American woman on the Nashville Police Department’s motorcycle squad, Camp Pendleton’s 2001 Female Athlete of the Year, two-time titleholder in Camp Pendleton’s annual Strongest Warrior Competition, and a running back for the San Diego Sunfire women’s professional football team. Armour published her first book, Zero to Breakthrough™ in 2011. Zero to Breakthrough: How a Breakthrough Mentality Creates Breakthrough Results! Vernice reveals, as a former Diversity Officer for Headquarters Marine Corps and liaison to the Pentagon, what it took to help a 200,000 personnel organization get back on track! When you bring people together, you will have differences and similarities that result in tension and complexities…THIS IS NORMAL! How you MANAGE diversity is the key!